November 14, 2013 in "Reload", "Stuff We Love"
You all know we like to keep you updated on the fresh new items we get in here at the shop, but we decided it would be a cool idea to let you know our personal favorites too. Things we've all used, loved and how they've stood up to our abuse. So instead of "Look! This is new!" it's "Look! We've used this and it's still rad!" So here goes. I'm sure most of you are familiar with R.E.Load bags, but just in case you're not, they're a custom bag company run out of Philadelphia. 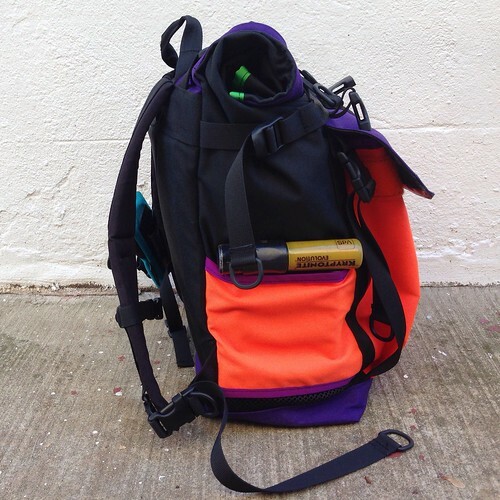 All their bags are made in the USA out of super tough materials, are waterproof and R.E.Load will even make certain repairs, not that you'll likely need them. If you look on the backs of cyclists around the city you'll see the familiar R.E.Load tag on a plethora of multicolored bags all over, no surprise. 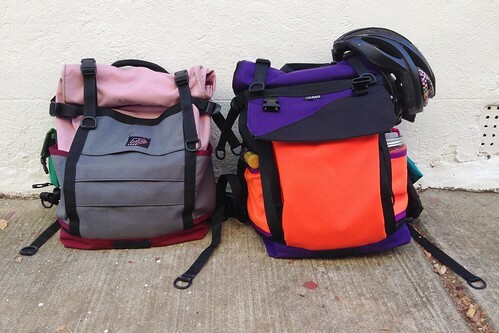 Here at the shop two of us use the small Flight Pack as our go to two strap bags. On the left is Heather's with the old front pocket and on the right mine with the newer front pocket design. They may be the smallest of the three sizes, but you can fit a borderline absurd amount of stuff into one. The roll top allows you to over stuff it or put some really weird shaped things in there with no problem. I've fit two full bags of groceries in the main compartment, a wine bottle in one side pocket and a baguette in the other (yes roll your eyes, but dinner was delicious). The bags are designed to be cinched down when carrying a light load, and easily expanded for when you need the space, which is really useful. Lucky for me, the cinching straps are in the perfect place to secure the tops of tall things in the side pockets ie; 750s of wine/water/plasma, or baguettes, maybe even a bouquet for your girl, your boy or your dog. The front pocket is perfect for small things like shades, lip balm, wallet. 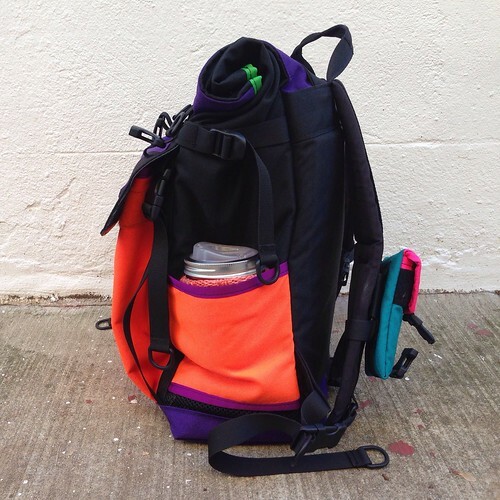 The interior has a cool multi-pocket thing going on that's great for flat repair stuff, reusable grocery bags, pens... things you want to have with you but don't need mixed in with your easy access front pocket stuff. 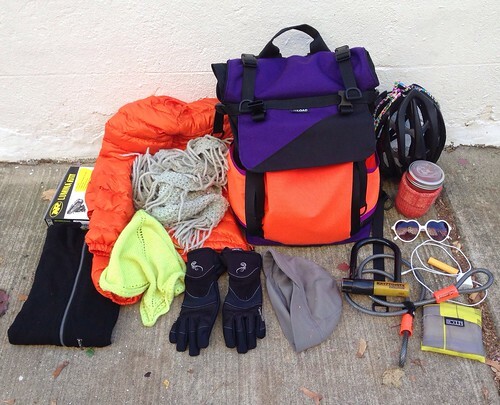 Generally I use my pack for adventuring/camping, to grocery shop and to ride to work. It does a great job with all three. The side pocket fits my u-lock so it's really easy to get to and the other usually has a pint jar with my Cuppow jar lid and something weird in it. The back is pretty rad too, it's padded so you can get away with just tossing stuff in there and you won't be jabbing yourself while riding. 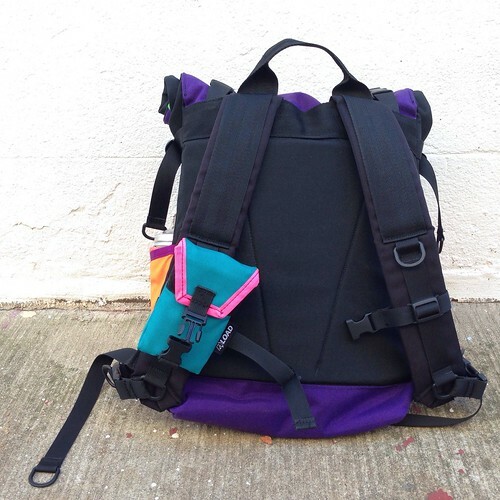 The straps have an adjustable chest strap to keep the bag secure and some very useful accessory attachment straps. I have a cell phone holster (also R.E.Load, also awesome) so I can whip my phone out to take pictures of the varied and sometimes amusing, othertimes kind of horrifying road debris around the city. Lastly, what is a bag post without a nice "what's in my bag" pic? Terrible, that's what. This is what I happened to have in my bag today and during these pics. That's a lot of stuff and there was room to spare. Not sure what the weather is going to be like when you leave where you're going? Just bring everything. Winter coat, two different wool scarves, extra wool mid-layer. It's no prob and you'll even have space for things you pick up along the way like a bottle of *insert your favorite drink here* or a sweet new headlight (score). So there it is, my big fat seal of approval. This definitely passes the daily use test and does it with style. Want to check one out? Feel free to come in to see what we've got and I might even let you look through mine. Thanks for killing it with this one R.E.Load!